Our middle-of-the-night breakdowns had put us around four hours behind as the paced slowed to let the engine settle back down again. It was going to be impossible to arrive at the planned 8am and to spend an hour with Deputy Mayor Josh Wilson to celebrate our completing the first leg of the challenge and Josh’s birthday. Luckily Josh was very understanding when we finally arrived at 11.45am. The Gold Coast sand was deposited on Bathers Beach and the water drained on to the sand before Rod rolled up his trousers and headed for the ocean to replenish his supply for the return journey. 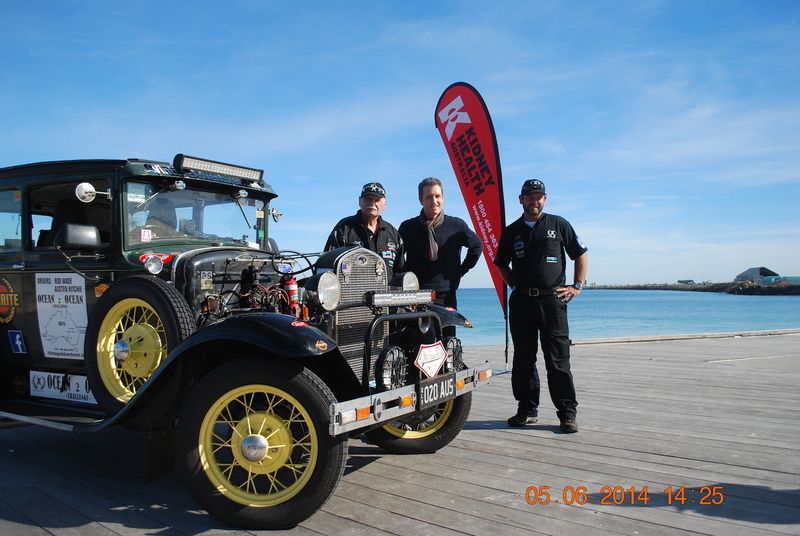 The journey from Surfers Paradise to Fremantle took 51 hours 31 minutes and 7 seconds. By 12.05pm we were back on the road, armed with a new crew, lots of supplies and thanks to the Ford Model A Restorers Club of WA, plenty of parts for the Tudor Rose if more problems were to arise.